"Peace if possible, but justice at any rate." State schools are generally primary or secondary schools mandated for or offered to all children without charge, funded in whole or in part by taxation. These schools are generally inclusive (non-selective) in admitting all students within the geographical area that they serve. The South Side is an area of the city of Chicago. It is the largest of the three Sides of the city that radiate from downtown—the others being the North Side and the West Side. The South Side is sometimes referred to as South Chicago, although that name can also refer to a specific community area on the South Side. Chicago Public Schools (CPS), officially classified as City of Chicago School District #299 for funding and districting reasons, in Chicago, Illinois, is the third largest school district in the United States. For the 2014–2015 school year, CPS reported overseeing 660 schools, including 484 elementary schools and 176 high schools; of which 517 were district-run, 130 were charter schools, 11 were contract schools and 2 were SAFE schools. The district serves over 396,000 students. Wendell Phillips Academy High School is a public 4–year high school located in the Bronzeville neighborhood on the south side of Chicago, Illinois, United States. Phillips is part of the Chicago Public Schools district and is managed by the Academy for Urban School Leadership. It is named for the noted American abolitionist Wendell Phillips. It was the first predominantly African-American high school in Chicago. The school opened in 1904. In 2010, Phillips became a turnaround school in an effort to lower the school's one–year dropout rate of 66.8 percent. The school received the Spotlight on Technology award from the Chicago Public Schools leadership technology summit in 2013. The school's attendance boundary includes areas of the South Side, Chinatown, and portions of the Chicago Loop. Senn High School is a public 4–year high school located in the Edgewater neighborhood on the North Side of Chicago, Illinois, United States. Senn is operated by the Chicago Public Schools system and was opened on February 3, 1913. The school is named in honor of surgeon, instructor, and founder of the Association of Military Surgeons of the United States Nicholas Senn. Senn has advanced placement classes, an International Baccalaureate Diploma Program, a fine arts program, and a Junior Reserve Officers' Training Corps program. It also houses the public but administratively separate, Hyman Rickover Naval Academy. The architect for the Senn High School building and campus was Arthur F. Hussander, who was the chief architect for the Chicago Board of Education; the contractor was Frank Paschen. William H. Wells Community Academy High School is public 4–year high school located in the West Town neighborhood on the Near Northwest Side of Chicago, Illinois, United States. Wells is a part of the Chicago Public Schools system. Wells serves grades 9 through 12. Wells is named after former superintendent of the Chicago Public Schools William Harvey Wells. On April 25, 1936, the school's name was changed to honor Jean Baptiste Point DuSable, the first non-native to settle the area; however there was a delay in implementing the name, as the exact spelling was in dispute. During the 1940s on thru the 1960s, DuSable enrollment was more than 4,000 which prompted two graduation ceremonies (spring and summer). During this period, DuSable became notable for its music program: Captain Walter Dyett was the longtime music instructor at the school. By the late 1950s, DuSable was surrounded by the Robert Taylor Homes, a Chicago Housing Authority public housing project and approximately 80% of the student population were residents. The Robert Taylor Homes project was demolished in stages between 1998 and 2007. Walter Henri Dyett was an American violinist and music educator in the Chicago Public Schools system. He served as music director and assistant music director at Chicago's predominately African-American high schools; Phillips High School and DuSable High School. Dyett served as musical director at DuSable High School from its opening in 1935 until 1962. He trained many students who became professional musicians. Robert Taylor Homes was a public housing project in Bronzeville on the South Side of Chicago, Illinois, bordered along State Street between Pershing Road and 54th Street alongside the Dan Ryan Expressway. The project was named for Robert Rochon Taylor, an African-American activist and the first African American chairman of the Chicago Housing Authority (CHA). It was a part of the State Street Corridor which included other CHA housing projects: Stateway Gardens, Harold Ickes Homes, Dearborn Homes and Hillard Homes. The Chicago Housing Authority (CHA) is a municipal corporation that oversees public housing within the city of Chicago. The agency's Board of Commissioners is appointed by the city's mayor, and has a budget independent from that of the city of Chicago. CHA is the largest rental landlord in Chicago, with more than 50,000 households. CHA owns over 21,000 apartments. It also oversees the administration of 37,000 Section 8 vouchers. The current acting CEO of the Chicago Housing Authority is Eugene Jones, Jr.
With the demolition of the Robert Taylor Homes, student enrolment at DuSable had substantially declined. Because of this, in 2003, Chicago Public Schools decided to phase out DuSable: the history of poor academic performance was also a factor. In 2005, three schools were opened in the building as a part of the Renaissance 2010 program. The three new schools: Bronzeville Scholastic Institute, Daniel Hale Williams School of Medicine and DuSable Leadership Academy were created by DuSable staff members. The DuSable Leadership Academy which was a part of the Betty Shabazz International Charter School was phased out due to poor academic performance and closed after the 2015–16 school year. Renaissance 2010 was a program of the Chicago Public Schools school district of Chicago, Illinois, United States. Pushed by for-profit education companies, Renaissance 2010 initiative was announced in June 2004 by the Chicago Public Schools and the City of Chicago. Renaissance 2010 called for 100 new schools by 2010. Under Renaissance 2010, the Chicago Public Schools closed over 80 public schools, and sought to create 100 charter schools by 2010. These schools were to be held accountable for test score performance through 5-year contracts while following one of three governance structures: charter, contract, or performance. The Betty Shabazz International Charter School is a charter school in Chicago, Illinois serving students in kindergarten through 12th grade. 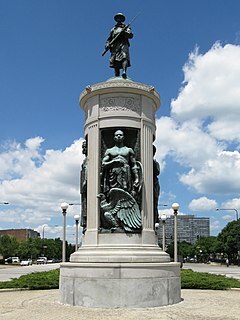 Douglas, on the South Side of Chicago, Illinois, is one of 77 Chicago community areas. The neighborhood is named for Stephen A. Douglas, an Illinois politician, whose estate included a tract of land given to the federal government. This tract later was developed for use as the Civil War Union training and prison camp, Camp Douglas, located in what is now the eastern portion of the Douglas neighborhood. Douglas gave that part of his estate at Cottage Grove and 35th to the Old University of Chicago. The Chicago 2016 Olympic bid planned for the Olympic Village to be constructed on a 37-acre (150,000 m2) truck parking lot south of McCormick Place that is mostly in the Douglas community area and partly in the Near South Side. Daniel Hale Williams Preparatory School of Medicine High School (DHW) is a public 4–year career academy high school and academic center The academic center serves 9th through 12th grade students. The school opened in September 2005 as a part of the Chicago Public Schools' Renaissance 2010 program. The school is named for Daniel Hale Williams, an African-American doctor who performed the first successful open heart surgery. Helping minority students get into medical school and become future members of the medical field is central to DHW's mission and vision. The school celebrated its first graduating class in 2011. A vocational school, sometimes also called a trade school, career center, or vocational college, is a type of educational institution, which, depending on the country, may refer to secondary or post-secondary education designed to provide vocational education, or technical skills required to perform the tasks of a particular and specific job. In the case of secondary education, these schools differ from academic high schools which usually prepare students who aim to pursue tertiary education, rather than enter directly into the workforce. With regard to post-secondary education, vocational schools are traditionally distinguished from four-year colleges by their focus on job-specific training to students who are typically bound for one of the skilled trades, rather than providing academic training for students pursuing careers in a professional discipline. While many schools have largely adhered to this convention, the purely vocational focus of other trade schools began to shift in the 1990s "toward a broader preparation that develops the academic" as well as technical skills of their students. Daniel Hale Williams was an African-American general surgeon, who in 1893 performed the first documented, successful pericardium surgery in the United States to repair a wound. He founded Chicago's Provident Hospital, the first non-segregated hospital in the United States and also founded an associated nursing school for African Americans. Red Holloway (1945) - jazz musician. Nathaniel Clifton (1942) — basketball and baseball athlete for DuSable, played for Harlem Globetrotters and Chicago American Giants, Nat "Sweetwater" Clifton was 2014 inductee in Basketball Hall of Fame. Harold Lee Washington was an American lawyer and politician who was the 51st Mayor of Chicago. Washington became the first African–American to be elected as the city's mayor in February 1983. He served as mayor from April 29, 1983 until his death on November 25, 1987. Earlier, he was a member of the U.S. House of Representatives from 1981 to 1983, representing Illinois' first district. Washington had previously served in the Illinois State Senate and the Illinois House of Representatives from 1965 until 1976. Jean Baptiste Point du Sable is regarded as the first permanent non-Indigenous settler of what later became Chicago, Illinois, and is recognized as the "Founder of Chicago". A school, museum, harbor, park, and bridge have been named in his honor. The site where he settled near the mouth of the Chicago River around the 1780s is identified as a National Historic Landmark, now located in Pioneer Court. Eugene "Jug" Ammons, also known as "The Boss", was an American jazz tenor saxophonist. The son of boogie-woogie pianist Albert Ammons, Gene Ammons is remembered for his accessible music, steeped in soul and R&B. Libertyville High School, or LHS, is a public four-year high school located in Libertyville, Illinois, a northern suburb of Chicago, Illinois, in the United States. Located at the intersection of Park Avenue and Dawes Street, it sits on the shore of Butler Lake and is part of Community High School District 128, which also includes Vernon Hills High School. The DuSable Museum of African American History is dedicated to the study and conservation of African American history, culture, and art. It was founded in 1961 by Dr. Margaret Taylor-Burroughs, her husband Charles Burroughs, Gerard Lew, Eugene Feldman, Marian M. Hadley, and others. Taylor-Burroughs and other founders established the museum to celebrate black culture, at the time overlooked by most museums and academic establishments. The museum is located at 740 E. 56th Place at the corner of Cottage Grove Avenue in Washington Park, on the South Side of Chicago. The museum has an affiliation with the Smithsonian Institution. Julian Clifford Mance, Jr. is an American jazz pianist and composer. Ronnie Boykins was a jazz bassist and is best known for his work with pianist/bandleader Sun Ra, although he had played with such disparate musicians as Muddy Waters, Johnny Griffin, and Jimmy Witherspoon prior to joining Sun Ra's Arkestra. Earle Lavon "Von" Freeman Sr. was an American hard bop jazz tenor saxophonist. Charles Anthony "Buster" Williams is an American jazz bassist. Williams is known for his membership in pianist Herbie Hancock's early 1970s group, working with guitarist Larry Coryell from the 1980s to present, working in the Thelonious Monk repertory band Sphere and as the accompanist of choice for many singers, including Nancy Wilson. Hyde Park Academy High School is a public 4–year high school located in the Woodlawn neighborhood on the south side of Chicago, Illinois, United States. Opened in 1863, Hyde Park is located in the Woodlawn neighborhood south of the University of Chicago. Hyde Park is operated by the Chicago Public Schools (CPS) district. In 2012, Hyde Park became the fourth Chicago public high school to become an International Baccalaureate school. Whitney M. Young Magnet High School is a public magnet high school located in the Near West Side neighborhood in Chicago, Illinois, United States. Young is operated by the Chicago Public Schools district. Whitney Young opened on September 3, 1975 as the city's first public magnet high school. The school consistently scores among the top high schools in the U.S. state of Illinois. In 2009, Whitney was awarded the Blue Ribbon Award. Admission to Whitney Young is granted based on entrance exam performance, standardized test scores, and elementary school grades, and is open to all residents of Chicago. The school is named after Whitney Moore Young Jr., a prominent civil rights leader. Chicago Military Academy-Bronzeville is a public 4-year military high school located in the Bronzeville neighborhood located on the South Side of Chicago, Illinois, in a building known as the Eighth Regiment Armory. The academy opened on August 24, 1999. The Academy includes a mandatory Junior Reserve Officers' Training Corps (JROTC) instructional component in addition to a four-year college preparatory curriculum. Charles Davis was an American jazz saxophonist and composer. Davis played alto, tenor and baritone saxophone, and performed extensively with Archie Shepp and Sun Ra. Dunbar Vocational High School is a public 4–year vocational high school located in the Bronzeville neighborhood on the south side of Chicago, Illinois, United States. Dunbar opened in 1942 and is operated by the Chicago Public Schools (CPS) district. The school is named in honor of the African–American poet, novelist, and playwright Paul Laurence Dunbar. Perspectives Charter Schools is a charter school network in Chicago, Illinois. The organization was founded by Kim Day and Diana Shulla-Cose, two teachers at Chicago's Dyett Middle School. Walter Henri Dyett High School For The Arts is a public four–year arts high school located in the Washington Park neighborhood on the south side of Chicago, Illinois, United States. The school opened in 1972. Dyett is a part of the Chicago Public Schools system and is named for American violinist and music educator Walter Henri Dyett (1901–1969). The school became an arts high school for the 2016–17 school year. ↑ "High School Code Search". College Board. Retrieved 24 October 2013. 1 2 3 "Chicago (DuSable)". Illinois High School Association (IHSA). 31 December 2009. Retrieved 3 January 2010. 1 2 3 "New Phillips High School To Open Tomorrow: Classes Also to Continue in Old Building". Chicago Daily Tribune. 3 February 1935. pp. S5. ↑ "NEW $6,000,000 Lane Technical To Open Sept. 17 :School Finest of Kind; Capacity 7,000 Students". Chicago Daily Tribune. 26 August 1934. p. 10. ↑ D. G. York; M.-M. Mac Low; B. Brown; L. M. Franco; L. M. Rebull; C. Graziani; J. Lauroesch. "DuSable High School Internet Project and its influence in connecting Chicago Public Schools to the Internet". Bulletin of the American Astronomical Society . 192: 27.05. ↑ "Student Killed at Chicago High School". AP News Archive. 14 October 1987. Retrieved 18 March 2014. ↑ "Witnesses Describe Du Sable Killing". Chicago Tribune. 27 September 1989. Retrieved 18 March 2014. ↑ Lewis, George E. (2008). A Power Stronger Than Itself: The AACM and American Experimental Music. University of Chicago Press. p. 11. 1 2 3 4 "Gene Ammons: The Jug". biographic sketch. National Public Radio. 20 February 2008. Retrieved 2 January 2010. Some of Ammons' stylistic versatility can undoubtedly be traced to his Chicago home ... He also learned from the renowned "Captain" Walter Dyett, the musical director of Chicago's DuSable High School. Dyett was instrumental in launching the careers of many other DuSable alumni, including the legendary crooner and pianist Nat "King" Cole and fellow saxophonist Johnny Griffin. ↑ "Ronnie Boykins". biographic sketch. Chicago Public Schools. Retrieved 3 January 2010. 1 2 Campbell, Robert L. (26 March 1995). "From Sonny Blount to Sun Ra: The Birmingham and Chicago Years". revision of a talk given by the author. University of Alabama-Birmingham. Retrieved 3 January 2010. John Gilmore (born 1931 in Summit, Mississippi, but raised in Chicago) had attended DuSable High School with its fabled band program ... He and Spaulding added their flutes to the Arkestral armamentarium. And then there was bassist extraordinaire Ronnie Boykins (1932-1980, another graduate of DuSable High School). ↑ "Redd Foxx". biographical sketch. Chicago Public Schools. Archived from the original on December 24, 2010. Retrieved 3 January 2010. ↑ Campbell, Gregory Alan; University of Washington (2006). "A beautiful, shining sound object": Contextualizing multi-instrumentalism in the Association for the Advancement of Creative Musicians. University of Washington. p. 299. ISBN 978-0-542-76897-2. ↑ "Ella Jenkins". biographic sketch. Chicago Public Schools. Retrieved 3 January 2010. ↑ "Harold Washington: Mayor of Chicago, Congressman". biographic sketch. Office of the Clerk of Cook County. Retrieved 3 January 2010. ↑ Coleman, Geoffrey (April 1994). "Harold Washington: Chicago politician". Illinois History. Springfield, IL, USA: Illinois Historic Preservation Agency. 47 (3): 72. ISSN 0019-2058 . Retrieved 3 January 2010. Harold attended the local public schools and Milwaukee's St. Benedict the Moor Catholic School. Unfortunately for him, he disliked it so intensely that he ran away three times. Harold then attended DuSable High School, but dropped out, claiming that he was no longer challenged by the classwork. 1 2 Bell, Taylor (29 January 1993). "Lewis' Goal: Revive Du Sable Basketball". Chicago Sun-Times. Archived from the original on 2 November 2012. Retrieved 2 January 2010. Lewis is determined to rekindle one of Chicago's proudest traditions. He recalls Du Sable's glory years . . . the famed 1954 team of Sweet Charlie Brown and Paxton Lumpkin that finished second in the state tournament, Maurice Cheeks, Kevin Porter, Larry Cross, Mitchell Moseley, William Dice, Stephon Butler. 1 2 Berkow, Ira (9 February 1991). "Sports of the Times; The Death Of a Prep Legend". New York Times. Retrieved 2 January 2010. But such future National Basketball Association players as Kevin Porter and Maurice Cheeks, who played many years later at Paxton Lumpkin's high school, DuSable, on the South Side of Chicago, would remember his name, and his legend. ↑ "Ernie McMillan" . Retrieved December 7, 2015. ↑ "Jason Williams" . Retrieved December 7, 2015. ↑ "Chuck Winfrey" . Retrieved December 7, 2015. ↑ "Don Cornelius". Chicago Public Schools. Retrieved 3 January 2010. ↑ "John H. Johnson". biographical sketch. Chicago Public Schools. Retrieved 3 January 2010. ↑ "Margaret Taylor-Burroughs". biographic sketch. Chicago Public Schools. Retrieved 3 January 2010. Wikimedia Commons has media related to DuSable High School .